New diverging diamond intersection opens in St. Cloud. Motorists had no trouble navigating one of the newest innovations on state roads when Minnesota’s second “diverging diamond” interchange — and the first one with traffic signals — opened Thursday in St. Cloud. The $10 million interchanage known as DDI opened at Stearns County Road 120 and Hwy. 15. 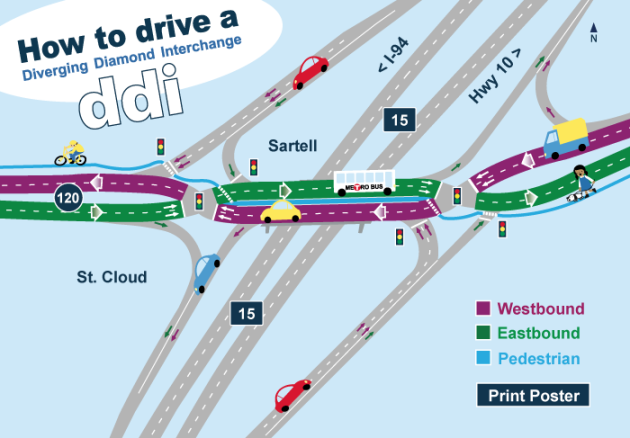 Unlike a traditional interchange, a DDI allows traffic to temporaily cross to the opposite side of a road, and then back to their original lanes. Pedestrians and bicyclists travel on the center bridge of the interchange. MnDOT officials say the interchanges which eliminate left turns across traffic are safer, increase mobility and reduce congestion. A third DDI is being built in Bloomington at the intersection of 34th Avenue and I-494. The State Patrol was on hand to monitor traffic and guide drivers through the new configuration when at 10:30 a.m., but "everything went off without a hitch," said MnDOT spokesman J.P. Gillach. "There were no problems." Several motorists showed up about two hours before the interchange officially opened with hopes of being the first to drive through the interchange, but were directed away, Gillach said. The state's first DDI opened last month in Olmsted County in southeastern Minnesota. The DDI in St. Cloud is the first to incorporate traffic signals, which are positioned at either end of the overpass spanning Hwy. 15. The design eliminates left turns for motorists coming off of Hwy. 15 and accessing County Road 120. "When you eliminate the left turn across opposing traffic, you eliminate one of the more dangerous traffic movements a motorist makes any given day," said Sue Groth, state traffic engineer. "By eliminating that movement and programming the signal system to accommodate the new traffic flow, we expect to see strong long-term improvements in both safety and mobility at this site." The DDI was built in one of St. Cloud's most congested and fast-growing areas, according to the St. Cloud Times.